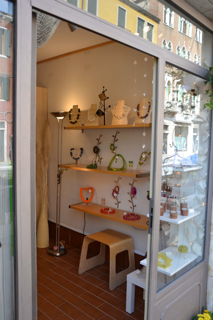 Shopping for Murano glass jewelry in Venice can be both the most affordable way to acquire real Murano glass and an experience in viewing the evolution of Murano glass from ancient to contemporary styles. There are a wonderful variety of Murano glass jewels available in Venice ranging from intricate pieces made with tiny beads threaded by an impiraressa to the large colorful pieces favored by contemporary artisans. Each bead, or “perle”, of a Murano glass necklace is handmade by a Murano glassmaster and each piece of Murano glass jewelry is individually hand assembled. The shops listed below sell authentic Murano glass jewelry, at reasonable prices, in styles to suit every taste. Venetian Dreams di Marisa Convento, 3805/A San Marco, On Calle Della Mandola Near Campo Sant Angelo. There is a small sign in Marisa's small window on Calle Della Mandola that reads, "an artisan works here". It is 100% true. Marisa is an impiraressa - an artisan trained in the ancient Venetian craft of threading and embroidering with seed beads made on Murano. 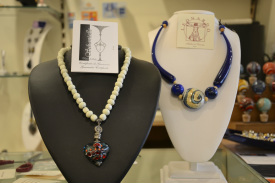 In collaboration with three female murano glass artisans, she also commissions contemporary beads and designs fantastic necklaces incorporating beads from all periods of Murano lamp work. Her designs are extraordinarily detailed, full of texture and almost as bright as her smile as she explains the history of colored Murano glass. Marisa's shop is the perfect place to go treasure-hunting for a precious piece of Murano glass jewelry and Marisa is a pure pleasure to speak with. Atelier Leonardo, 1703 Cannaregio on Rio Tera San Leonardo (Strada Nova). A promised land in the busy center of Venice owned by someone who understands "the heart of glass". Leonardo carries pieces by Venetian artists so particular that they rarely sell outside of their own shops. Though there are some small pieces for sale to casual passers by, this shop is really a showroom for the most unique Murano glass jewelry in Venice. In fact, the owner told me that many of the pieces are “too precious to sell". I was most drawn to the pieces by Muranero and Igor Balbi. 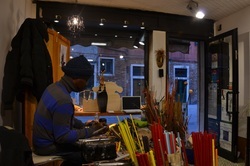 But Leonardo has work by many Venetian artisans and also offers authentic vintage Murano glass jewelry. 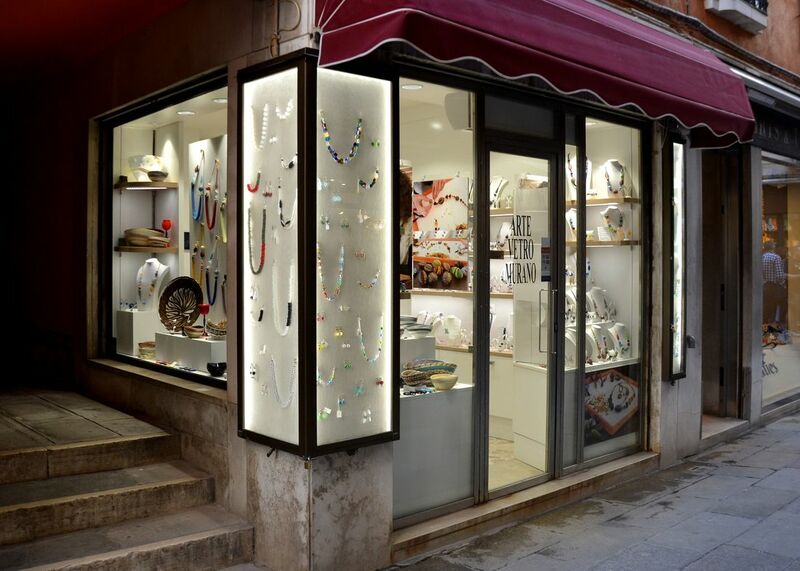 Nestled snuggly between the luxury goods stores that ring the Piazza San Marco, and only a one minute walk from the square itself, you can find Fabiana's Murano glass beadwork shop. Working with only authentic Murano glass beads, Fabiana designs and hand-makes the lovely colorful necklaces and earrings on display, and also offers clients made-to-order pieces. The additional Murano glass objects offered here are all very well made pieces by some of the most highly regarded contemporary glass masters, including, for example, vases by Mattia and Marco Salvadore. Muranero 3545 Castello, On Salizada del Piganer Near Bragora. Muranero is as unique among Venetian shops as it's proprietor, Moulaye Niange, is unique among Venetian artists. Moulaye uses traditional Murano glass making techniques (“Mura”) in crafting Venetian glass jewelry inspired by traditional African designs (“Nero”). Every glass bead, “perle”, is hand-blown in the shop. The fusion of two artistic cultures and the resulting modern and beautiful pieces make this shop an absolute must-visit in Venice. Moulaye's work is very highly renowned - it has been worn on the runways at fashion weeks the world over - yet, you'll find that Moulaye is a down to earth and welcoming arts. Arrive at the right time and you'll be able to watch him work and may even get to try your hand at glass blowing. See more work by Muranero on their website. Papuni Arte di Ninfa Solerno, 2834/A Dorsoduro, Near Campo San Barnaba. Talk about cool, fun and totally modern stuff! 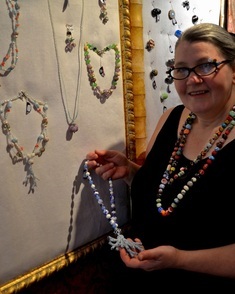 At Papuni Art Venetian jewelry designer Ninfa Salerno sells her original creations made of all kinds of modern materials ranging from Murano glass beads through resins and semi-precious stones. This is buy now, wear it all summer and love it forever stuff at perfectly reasonable prices. La Perla Nera, 1998 Santa Croce, Calle Rioda. A fun and inspiring place to shop for jewelry gifts for yourself or souvenirs with flare! 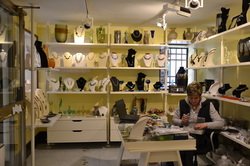 The artist here collects beads from every studio on Murano then designs and makes each and every stunning piece in the shop. There are a huge number of different styles on display in impressively original combinations. Choosing one would be the biggest challenge here!